I love to indulge on special occasions like many of us do. Last week was my birthday, and a friend brought me some chocolate cupcakes that sat around for a few days. They were AMAZING. I was also treated to a few lovely meals at some of Boulder's best restaurants - it was delightful! I am definitely a foodie at heart and I was upping my pleasure meter all week long - I feel great about it. The problem most of us struggle with isn't the special occasions, but rather our daily habits often followed by the horrible self-sabotaging + icky thoughts that follow suit. Anything from that bowl of jolly ranchers that we walk past all day at the office, to too many cookies after dinner, to those extras that we find ourselves munching on when we are a bit tired, overwhelmed, sad or stressed. These OH so common moments can add up to a lot when we get real with ourselves, and even worse - they often fill our thoughts with guilt and shame for days to come. Navigating our desires can drive many of us a little crazy at times. Nothing can match the fiery energy in our bodies that is created by pure desire. Desire is one of the strongest forces in the universe – food and beyond. Desire is the pure creativity, drive, passion, and pure life force pulsing through each of us. While desire can help us stay grounded and focused on where we put our attention, it can also create illusion, lead us astray, and create more emptiness than when we started. Though the promise of fulfilling a desire always promises some kind of delight, it can also complicate and produce other areas of conflict in our lives. We reach into the cookie jar time and time again, knowing that this temporary gratification will later leave us feeling tired, guilty and off balance. We indulge in that shopping spree that is truly not in our budget, to then suffer later with buyer’s remorse and feelings of regret. We order that extra drink at dinner, and wake up the next morning tired and lethargic. Desire seems like a good idea, but it also can feel hard to navigate and trust. When we align our inner world with our outer world, our inner self with the ways we move through our days, and the feelings we are seeking with how we choose to spend our time and energy, we attune with what I call ouraligned desire. Aligned desire is an artful expression of who we are, our wholeheartedness, and our unique body-mind connection and purpose with what we are manifesting in the world. When the inner and outer expressions of ourselves are in balance, we move through life with more ease and satisfaction. Aligned desire will serve the highest good (for ourselves and others). We have to be discerning and refine ourselves. We have to look closely at our automatic behaviors and habits. We have to develop the capacity and awareness to make conscious choices when a desire arises. Does a particular desire serve the highest part of ourselves, or are we simply, mindlessly perpetuating some habit that actually shadows our being? Aligned desire breathes vitality into our own fulfillment from the inside out. Aligned desire acknowledges and honors the challenges past while energizing us and making us the master of our own destiny. When used wisely, aligned desire is ‘superfood’ for our souls. Foodie fear#1: If you listen to your body, she will lead you down the wrong path, your desires are complicated and you cannot trust them. Foodie fear #2: There is so much to do. You don’t have time for self-care, feeding yourself well, making you your #1, feeding yourself well is impossible. Foodie fear #3: You can’t even remember that last time you were able to love your body, especially around your eating, you feel hopeless. This is our last week where I have been sharing with you therich and heartwarming Solstice Sessions. (you can access the previous Solstice Sessions HERE)These are my little whispers of winter’s wisdom, some guidance as we embrace the darkest nights of the year together, and some appetizers from my most complete body of work,THE YOGA OF EATING 2017that begins January 30th. (registration is open). 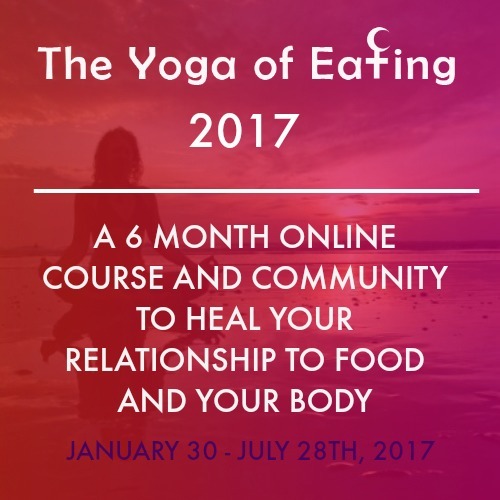 Check out the details below.THE YOGA OF EATING 6-month course and community to heal your relationship to food and your body.Webegin January 30th, 2017. Many of you have daydreamed of a life filled with positive thoughts and habits that support your health and your happiness. If this is the case, THE YOGA OF EATING is just right for you. For the whole month of January, Boulder Nutrition will be partnering withLululemon (we are both Canadian!) to bring you 5 FREE community classes. 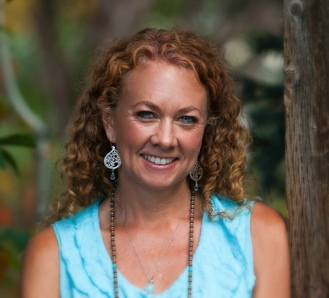 My mission is to help heal the feminine through food, mind-body connection and pleasure.Learn more here.